Major changes to UK pension rules come into force at midnight, in what Chancellor George Osborne has called "a revolution". 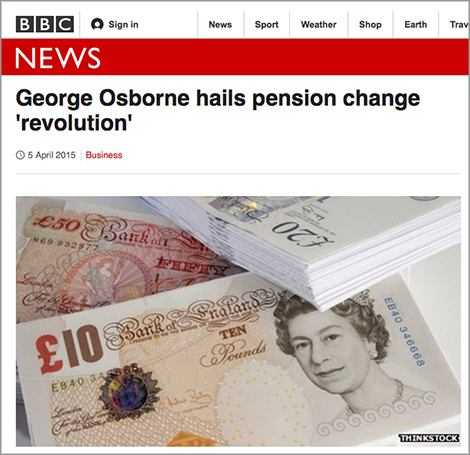 He said the moves were the "biggest changes to pensions in 100 years". People aged 55 and over will be given new powers to decide what to do with their retirement savings. From Easter Monday, they can cash in Defined Contribution (DC) pension savings. But there have been warnings about potentially big tax bills. Mr Osborne told Sky's Murnaghan programme: "What it means is that people who have worked hard and saved hard can have access to their pensions savings." He also urged people to make use of the government's guidance scheme. The Pensions Advisory Service (TPAS) will run the Pension Wise guidance service for those approaching retirement. Pension savers will no longer be required to use their pension pot to buy an annuity when they approach retirement. Some 540,000 people will be able to take control of their savings from 6 April, according to the government. But the Institute for Fiscal Studies (IFS) has said many people face paying tens of thousands of pounds in income tax if they cash in their pensions pots. But the Treasury says they have consistently stated that 25% of people's pensions is tax free and the rest is taxed at the marginal rate. There have also been concerns that some people may by hit by pension scams, or run out of money too early. Labour have welcomed the new pension flexibilities, but say they have repeatedly warned that the government has not thought through the risks of "rip-off charges" being taken from people's savings. "That's why we welcomed the announcement by David Blake's Independent Review of Retirement Income that they are studying the case for a new charge cap on pension products offered to savers by their pension provider to replace annuities," said a Labour spokesman.